A LIMERICK MAN has been fined €1,150 and restricted from keeping dogs for 18 months, after being convicted today of causing unnecessary cruelty to numerous animals. Seamus Looby of Raheen, Garryspillane, Co Limerick, pleaded guilty to charges including causing unnecessary suffering to dogs and having chained, unburied carcasses of two adult dogs and one puppy at his property. He has received a fine of €1,150 and Judge Marion O’Leary ordered him to pay an additional €1,000 to the ISPCA towards the cost of the investigation. Judge O’Leary also restricted Looby from keeping dogs for a period of 18 months under Section 58 of the Animal Health and Welfare Act 2013. ISPCA animal welfare inspectors seized 37 dogs from Looby’s farm on 16 May 2017 after they were alerted to the condition of the dogs on his property by a veterinary inspector for the Department of Agriculture. The dogs, mostly collies, were found in substandard conditions without access to clean drinking water. Many were flea-ridden, tightly chained to the outhouses and sheds, and were weak and lethargic due to the lack of basic care. “Failure to uphold the basic level of care of these animals is just not acceptable. The sheer number of them and the way they were grossly neglected was deplorable,” ISPCA senior inspector Lisa O’Donovan said. Email “Farmer found guilty after almost 40 dogs chained and neglected on property”. 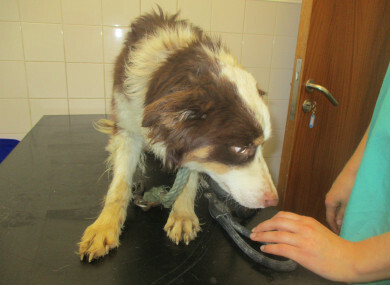 Feedback on “Farmer found guilty after almost 40 dogs chained and neglected on property”.